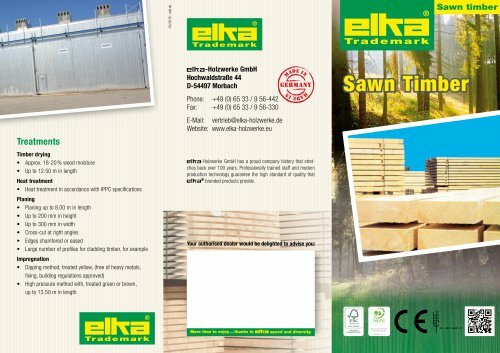 elKa-Holzwerke GmbH has a proud company history that stretches back over 100 years. Professionally trained staff and modern production technology guarantee the high standard of quality that ell\a® branded products provide. Your authorised dealer would be delighted to advise you: Treatments Timber drying • Approx. 18-20 % wood moisture • Up to 12.50 m in length Heat treatment • Heat treatment in accordance with IPPC specifications Planing • Planing up to 8.00 m in length • Up to 200 mm in height • Up to 300 mm in width • Cross-cut at right angles • Edges chamfered or eased • Large number of profiles for cladding timber, for example Impregnation • Dipping method, treated yellow, (free of heavy metals, fixing, building regulations approved) • High pressure method with, treated green or brown, up to 13.50 m in length More time to enjoy ... thanks to BllTB speed and diversity.